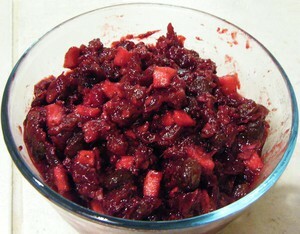 Rinse cranberries; remove any shriveled ones. Add all the Pressure Cook Ingredients to the pot & give a quick stir. Pressure Cook on High Pressure for 1 minute; 7 min Natural Pressure Release. Press Cancel, remove lid & stir cranberries. Press Saute and add all the After Pressure Cooking Ingredients. Stir until sugar is dissolved & sauce has thickened...a couple minutes. * I used the zest & juice of 1 large orange. * If you don't get 1/4 cup juice from your orange add apple juice or water to make it 1/4 cup. * I keep my ginger in the freezer & grate it while frozen. * You can use dark or golden raisins (I used dark). * You can adjust the amount of sugar to suit your own taste.